You don’t realize how much your business relies on your inkjet printer until you’re printing blank sheets of paper. You can maintain your office’s printing productivity with the products and services of Sandia Office Supply. We have the inkjet supplies you need and next-day delivery to get them to you fast. 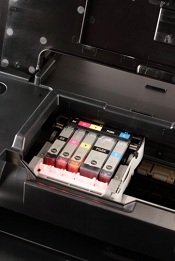 Our inkjet printer supply includes quality alternatives to new inkjet cartridges, too. We carry Elite Image remanufactured inkjet cartridges as well as provide inkjet refills. Our office supply experts can help you find other ways to reduce your office supply costs—just ask your designated customer service representative! It takes more than just ink to print, and Sandia Office Supply has a wide selection of printer paper to meet your needs. In addition to multi-use colored and white paper, we also carry photo paper and other specialty papers that allow you to make the most of your printer’s photo quality capabilities. We know you can’t wait for your inkjet cartridges and refills. Sandia Office Supply provides free next-day delivery with no minimum order…and ordering is easy with our barcode catalog and scanner or online system. Open an account today to experience all the benefits of working with a local office supply source. Contact us for more information. Call 505-341-4900 to order your inkjet printer supplies from Sandia Office Supply of New Mexico today!